By Gord Whitehead for the Strathroy Age Dispatch. Reprinted with permission. 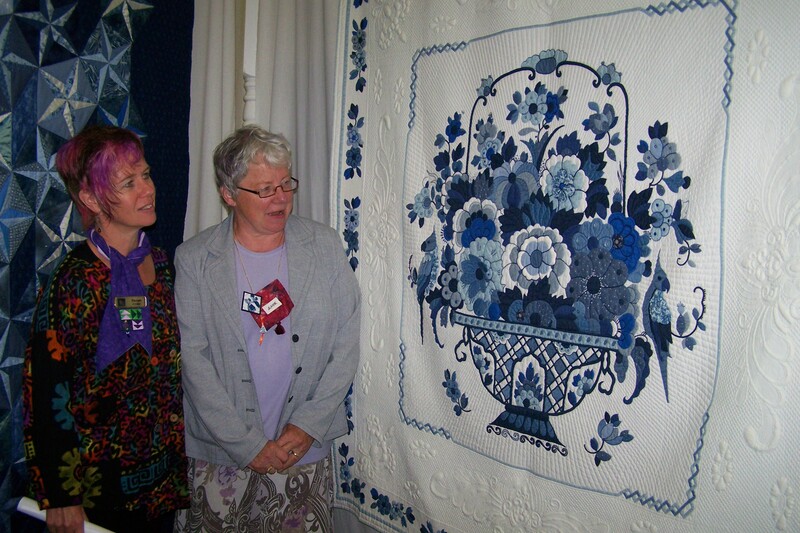 Raven Emslie, left, and Jeanne Hamers admire the beauty of ‘Holland’s Glorie’, one of 137 spectacular Quilts of the Netherlands on show last week in Ailsa Craig Recreation Centre. The quilt is the work of a woman named Ted Storm who was inspired by her grandmother’s gift of a Delftware plate. Ailsa Craig resident Emslie is a key member of the community group that organized and hosted the exhibits and Amsterdam area resident Hamers is president of the Dutch Quiltersgilde which made its first journey to Canada. Jeanne Hamers, president of the Dutch Quiltersgilde, told Focus the 137 quilts her group brought to the show are “the cream of the crop” selected by the guild’s executive committee from thousands of prospects. Founded in 1983 and now with 14,000 members, Holland’s is the largest quilting guild in Europe, said Hamers who lives near Amsterdam. Twenty Quiltersgilde members made the journey to Ailsa Craig where they were billeted at the homes of area families. “Everybody’s happy. We’ve had a wonderful time. The community has done its utmost to make us welcome,” the guild president said. An average 60 volunteers a day worked at the show, Emslie recalled. Hamers noted several of those volunteers are Dutch descendants and “it was very warming. A few even cried when they could speak Dutch again.” Of seven vendors of fabrics and other quilting supplies, two came from Holland and sold virtually every stitch of merchandise. Petra Prins of Den Haan & Wagenmakers was so pleased she offered to return to sell at Ailsa Craig’s next international quilt festival already booked for May 1-5, 2012. “People like Dutch fabrics which are quite different from Canadian fabrics,” said Hamers. They are a type of cotton with reprinted patterns, old traditional costumes, mostly red, white and blue with a bit of purple. Prins featured original Dutch designs from the 17th and 18th centuries. Vendors also conducted workshops for visitors. Posted on June 1, 2011, in Quilt block patterns., Supporters & Sponsors. and tagged Holland, quilt show. Bookmark the permalink. Leave a comment.